For the peninsula on Northern Cyprus, see Karpass Peninsula. 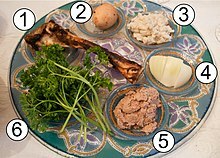 Karpas (Hebrew: כַּרְפַּס‎) is one of the traditional rituals in the Passover Seder. It refers to the vegetable, usually parsley or celery, that is dipped in liquid (usually salt water) and eaten. Other customs are to use raw onion, or boiled potato. The word comes from the Greek 'karpos' (Greek: καρπός) meaning a fresh raw vegetable. The karpas is traditionally placed on the seder plate on the left side, below the roasted egg. The liquid may be any of the seven which make food capable of becoming ritually impure, although salt-water or wine vinegar are usually used. The idea behind the salt water is to symbolize the salty tears that the Jews shed in their slavery in Egypt. One reason given for dipping a vegetable into saltwater is to provoke children to ask about it, as per the theme of the Seder night that the story is to be recounted by way of question and answer. Dipping a vegetable prior to the main meal is not usually done at other occasions, and thus arouses the curiosity of the children. There is a second ceremonial dipping later in the Seder, when maror is dipped into the charoset. Hence one of the Four Questions, traditionally sung by the youngest at the Seder table, asks why "on all other nights we do not dip vegetables even once, on this night, we dip twice." This page was last edited on 16 April 2019, at 13:40 (UTC).